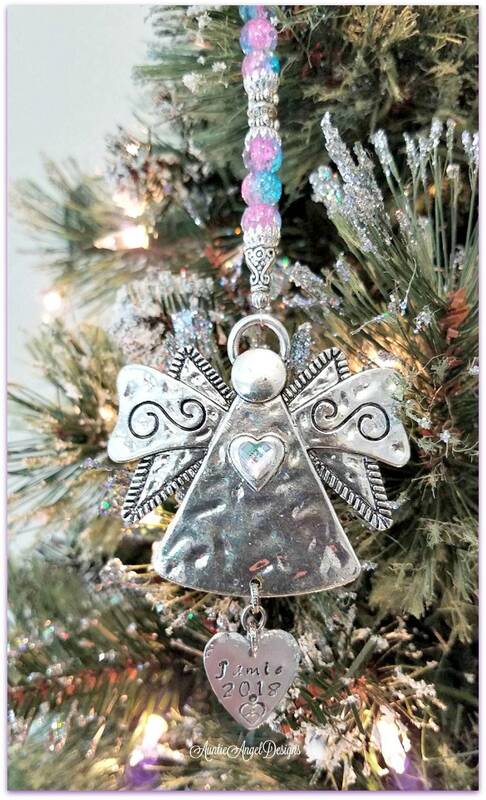 This angel baby ornament is a sweet gift by Auntie Angel Designs for a great year-round baby sympathy or new-baby gift. 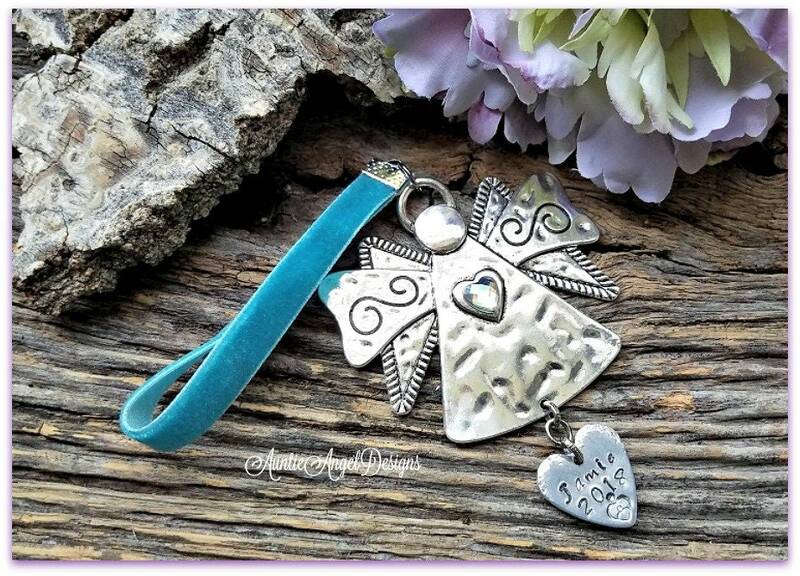 This gorgeous piece is a special tribute to a precious baby in Heaven or on earth. 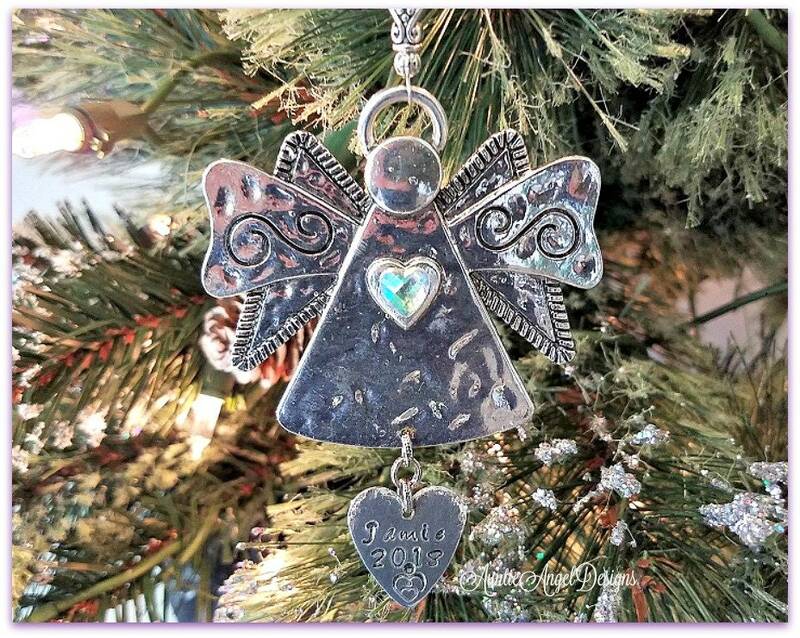 Each metal angel is made of zinc-based alloy and is lead and nickel safe and is approximately 3" long with stamped aluminum name heart and is 2-4/8" wide. The velvet ribbon option adds another 3." The beaded option adds another 4." 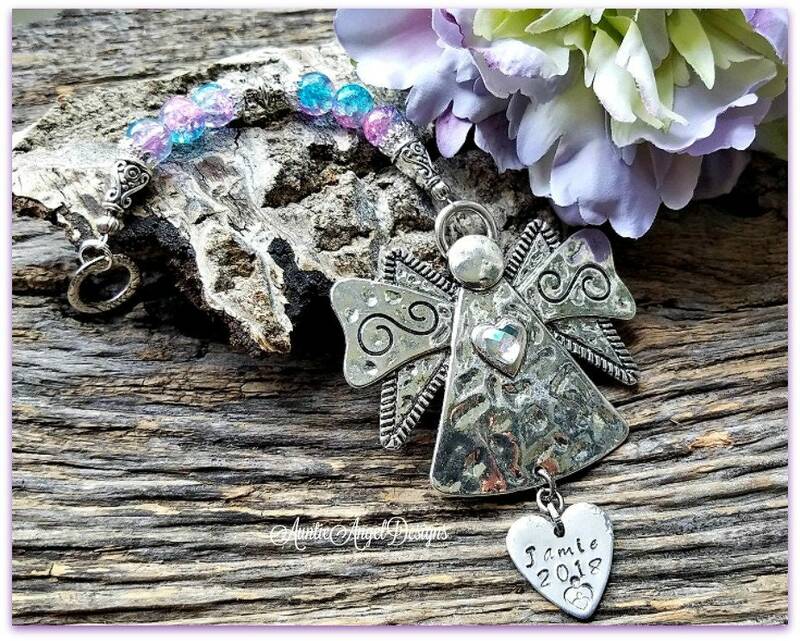 A cute AB crystal resin heart bead accents the angel's heart. 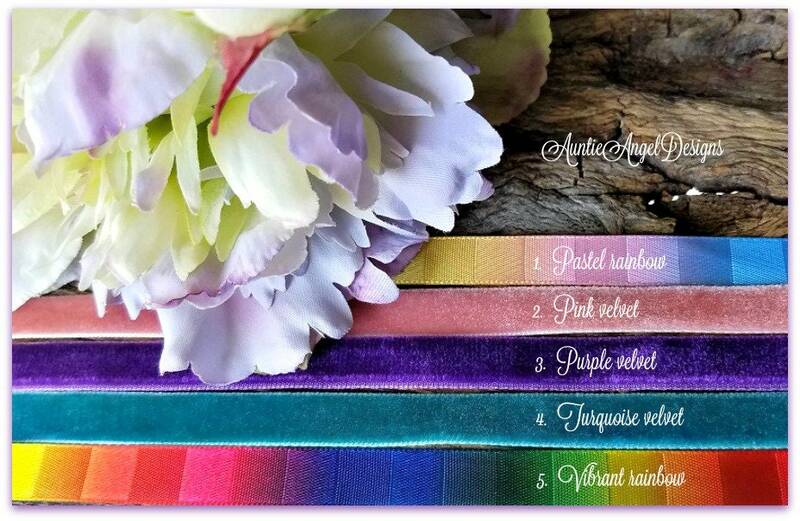 The velvet ribbon comes in turquoise, pink, or violet. The beaded option is pink and turquoise glass crackle beads with pewter and silver-plated bead accents and bead caps strung on jewelers wire and is finished with a silver-plated ring. I personalize this piece with the angel baby's name stamped on a 3/4" aluminum heart charm. A name can be stamped -- 7 to 8 characters maximum across -- and on only one side of the heart. I can also stamp a year, if requested. As each letter is hand-stamped by me, letter by letter, alignment and spacing may, and most likely will be, slightly off, which is the beauty of a custom hand-stamped piece. The name will NOT look like it has been engraved by a machine. I finish the heart charm with a beautiful mom and baby stamping. 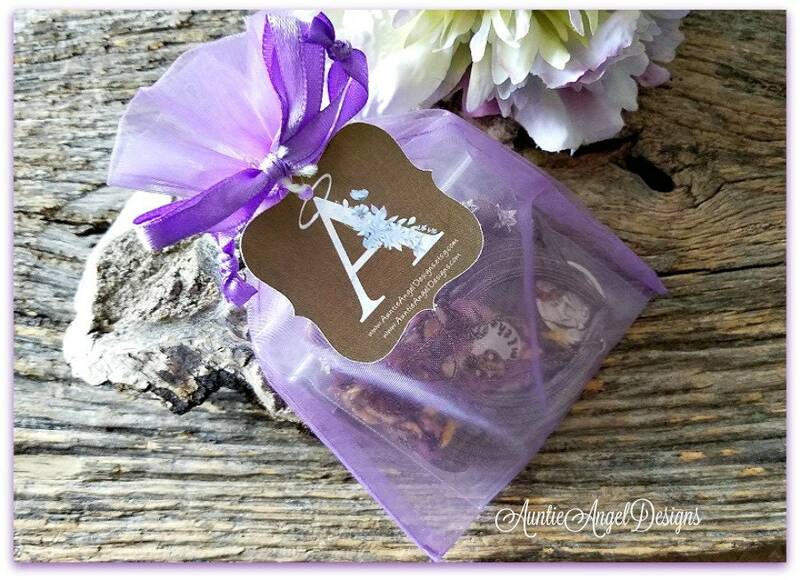 You will receive ONE ornament in a lovely lavender-colored organza pouch.